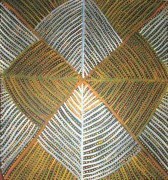 Ada Bird Petyarre was born around 1930 on the old Utopia station at Atnangkere. Ada was an Anmatyerr speaker, she spent her younger years assisting with work on the station and looking after goats. Ada was an acclaimed artist and elder of the Utopia community. She was well known for her vibrant Awelye body paint designs and for her distinctive representation of Arnkerrthe (Mountain Devil Lizard) paintings. 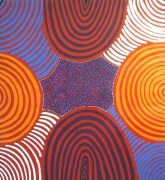 Ada also painted a variety of other Dreaming images including Bush Bean, Emu, Pencil Yam, and Grass Seed in common with Emily Kngwarreye and Gloria Petyarre.